Helping contractors answer the question, "What do I write about?" 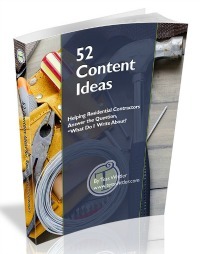 Inside, you'll get 52 content ideas for your blog, eNewsletter and more! 22 new ideas for making "construction talk" interesting for your readers. 3 valuable ways to share your projects so they are inspirational and captivating. 6 interesting ways to use dates on the calendar to grab readers attention. PLUS - 6 bonus ideas and tips!